Abstract: The superior properties of the single particle counting semiconductor pixel detectors in radiation imaging are well known. They are namely: very high dynamic range due to digital counting, absence of integration and read-out noise, high spatial resolution and energy sensitivity. The major disadvantage of current pixel devices preventing their broad exploitation has been their relatively small sensitive area of few cm2. This disadvantage is often solved using tiling method placing many detector units side by side forming a large matrix. The current tiling techniques require rather large gaps of few millimeters between tiles. These gaps stand as areas insensitive to radiation which is acceptable only in some applications such as diffraction imaging. However standard transmission radiography requires fully continuous area sensitivity. 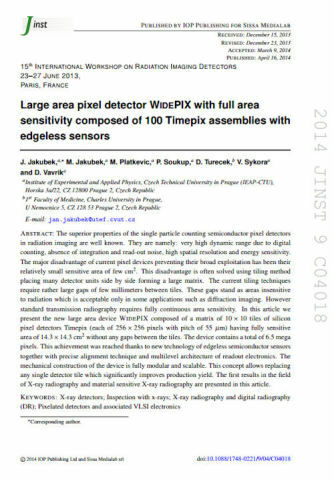 In this article we present the new large area device WIDEPIX composed of a matrix of 10 × 10 tiles of silicon pixel detectors Timepix (each of 256 × 256 pixels with pitch of 55 µm) having fully sensitive area of 14 .3 × 14 .3 cm2 without any gaps between the tiles. The device contains a total of 6.5 mega pixels. This achievement was reached thanks to new technology of edgeless semiconductor sensors together with precise alignment technique and multilevel architecture of readout electronics. The mechanical construction of the device is fully modular and scalable. This concept allows replacing any single detector tile which significantly improves production yield. The first results in the field of X-ray radiography and material sensitive X-ray radiography are presented in this article.